Jerry Jakubovic concentrates his practice on intellectual property issues and transactions, with particular focus on trademark clearance, prosecution, maintenance and enforcement, both domestically and internationally. His work includes advising clients in relation to trademark applications, refusals, renewals, licensing and all aspects of trademark disputes, including infringement, opposition and invalidity actions in the United States and abroad. Jerry's experience extends to general licensing, privacy and brand protection matters, as well as researching and negotiating copyright disputes. An extremely passionate pro bono publico advocate, Jerry serves as a liaison to various organizations, such as those supporting entrepreneurs and microbusinesses in New York City, assisting with placement and operation, and frequently handles matters personally. 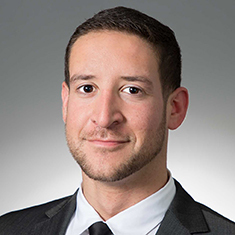 Prior to joining the firm, Jerry had gained experience in intellectual property and licensing issues by working as a legal intern throughout law school at boutique law firms concentrating in intellectual property and licensing matters. Jerry primarily worked for clients in the global fashion and financial services industries. Jerry also worked as a corporate paralegal before entering law school, where he was involved in complex commercial transactions. Jerry received his JD from New York Law School, where as an Innovation Center associate, he earned a certificate in Intellectual Property Law, which awards students who have focused considerable time and energy on vanguard issues in trademark, copyright and patent law, and was also a member of the Media, Entertainment, & Fashion Law Association as well as the International Law Society. As an undergraduate, Jerry attended Tulane University in New Orleans, where he majored in Philosophy: Law, Morality & Society, and served as a debate team coach for local disadvantaged youth. Shown below is a selection of Jerry’s engagements.